I am a gardener and it is beginning to look a lot like Christmas. … that I am tempted to buy poinsettias, Norfolk Island pines, Christmas cactus, amaryllis bulbs, and rosemary topiaries whenever I see them. But I try to avoid buying them on days like today when it is 36 F, the wind is howling and it is steadily raining. It’s not that good for the indoor plants to be exposed to this kind of weather. … that my “gift suggestion list” is loaded down with new gardening books and gardening tools, even though I have a lot of gardening books and tools already, including all those hoes. But I think I can always use more. … that when I think about the gifts of the Twelve Days of Christmas, the only one I’m really interested in is the “partridge in a pear tree”, mostly for the pear tree. … that most many of the ornaments on my Christmas tree relate directly to gardening or a nature theme of some kind and some are actually little hoes. … that one of my favorite Christmas carols is “The Holly and the Ivy”. ... that when I see one of those holiday commercials for the expensive car with the big red bow on top, I think it would be better if it was a new truck for gardening with a big green bow on top. … that I will check on Christmas morning for the tell-tale tracks of the Christmas Cottontail in my garden. 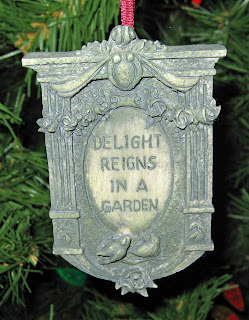 Are you willing to admit how being a gardener affects your Christmas season? I admit that I like to give potted Hyacinths & Amaryllises as Christmas gifts. And I further admit that I usually buy one for myself while I'm at it. There's no question I'm a gardener at Christmas. Our house is decked with live poinsettias, wreaths made from our own shrubs hung, and a wishlist full of gardening books and goodies. You made me smile! My best present in recent years has been a pair of thick leather gloves for boulder lifting! So funny, I often think about that same car commercial in the same way! But I'd love it to be a 55 Chevy painted in some snazzy color! Most of my gift giving, decorations & desires revolve around gardening. Oh yes, my garden ornaments are all up and my gift list is full of garden related wishes. Being a gardener affects my Christmas season because I can go out and gather my own green decorations and give notecareds with photos of my garden - and no one has any trouble thinking what a gardener would enjoy. Since I began my blog 2 years ago on the Feast of St. Nicholas, that anniversaary is another addition to my celebration. Come visit and comment. You'll be entered in a drawing for Right Rose Right Place by Peter Schneider and 2 dozen CowPots for seed starting season. Carol. It is true that gardening adds a filter to our attention span. Eyes light up and we sit a little straighter when we hear or see anything relating to growing things. We are lucky this year to have our family coming here instead of us spending yet another Christmas in a hotel. There will be a tree and the ornament theme will be the fruit and veggies that we used to collect made of glass. Very garden-ey. I usually get a pointsettia every year, but this year I bought a new Christmas cactus in an unusual and beautiful color instead. It will join the four other Christmas cacti I have. They perform year after year, whereas poinsettias will not. I am also tempted to buy more cyclamen. The ones I have blooming now are so beautiful. Again, they do their thing year after year. They're not exactly Christmasy, but I have three orchids in bloom and six in bud, so it will be a flower filled Christmas for us. I think my gardener-ness comes out in my yearly conflict over the Christmas tree. I love having an actual tree inside my house, and its scent is one of my favorite aspects of Christmas. But I feel guilty every year for cutting down a living tree for personal enjoyment for a limited time. However, I'm playing a little bit of gardener Santa Claus on my blog with a seed giveaway contest (which you may like!! ), so maybe that will make me feel better this year! The tree is one of my favourite parts of Christmas -- which I celebrate in a (figuratively) pagan way. I love the idea of decorating a tree and fitting it with lights to celebrate and symbolize life that endures through the long, dark night of winter. For this reason, my trees have to be fake. But they're so loaded with pretty ornaments collected over the years that they're hard to spot. I have given bulbs, for forcing, as gifts in the past but I have so many other interests, besides gardening, that there isn't enough room for one of them to dominate. Besides, in winter, everything is dormant so I concentrate on skiing and snowshoeing, reading, not gardening books, and writing. I can relate to this. My Christmas theme this year is "snow-birds" and my tree is covered with birds, berries, dry fruit and all things natural. I would love to have a hoe ornament...I've never seen one! I did find this year several bird houses, bird baths and bird feeder ornaments and last year found a wheelbarrel and potted cactus! Merry Christmas!